Hey, finally got some tasty fresh Turkey Hill to review, and overall, this one gets my approval! I know, you're shocked. Hey, besides birthday cake, I've never met a bad container of Turkey Hill. Guess I'll just have to keep trying different flavors 'til I find one...mmmm, excuse to eat more ice cream. So, today's fresh container is the lower calorie, Vitamin D and Calcium enriched Raspberry Chocolate Chunk. I've mentioned before that I don't think Raspberry should be messed with. Chocolate chips and chunks just always seem to detract from the simple yet reliable nature of a smooth Raspberry ice cream. Even with my first bite of a chunk, I was unsure and thought this was just going to be another raspberry ruined by cheap chocolate. Now, it may have been the freezer, but this stuff melted fast. It was very soft, but this had an unintended consequence. This texture wound up working great with the semi-soft nature of the chunks. Plus, the chunks have a more mild flavor then I'm use to, which adds to their overall subtly here. I wasn't expecting it, but I like it. Well, I still probably technically prefer just plain non-lowfat Black Raspberry, but this is a worthy alternative. I almost forgot to mention that while the chunks do their best to take a back seat here, you will be left with a chocolate aftertaste and not a raspberry one. This isn't a bad thing, just an observation. On Second Scoop: So, let's recap. 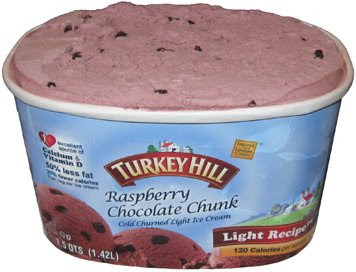 The lighter raspberry ice cream is decent, though it obviously can't match Turkey Hill's very tasty regular black raspberry. I also find the soft chocolate chunks are more subtle and pleasant than the hard chips you might find in say Breyers Black Raspberry Chocolate (Chip). We have a respectable light ice cream here, but to be honest, I'd probably be happier without the chocolate chunks...or at least less of them.